You’ve been here before: it’s the Fourth of July cookout and the between-meal hunger is hitting. Sure, you came for the lunchtime steaks, burgers, and sausages, but one thing’s led to another and you’re still hanging around. You could snack on the chips, dips, and desserts that are within arm’s reach, or you could have some salad and veggies. But you know that these options will either leave you with all kinds of unwanted calories or feeling extremely unsatisfied. It’s basically a no-win situation. Thankfully, I know how to serve up a win for those troublesome occasions. I have a snack that’s healthy, filling, and tasty. Best of all, this recipe only takes about 10 minutes, tops, to throw together. Not only are these snacks tasty, healthy, and filling, but you know exactly what’s in them. No mystery ingredients or calories that will sabotage your Fourth of July weekend! 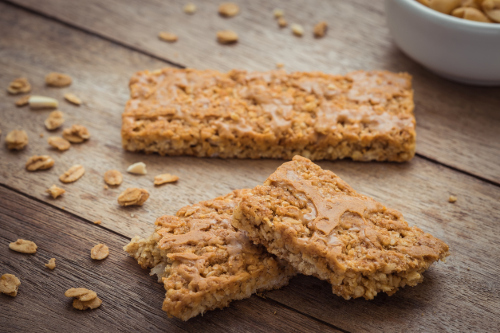 So grab a paper and pen and write the ingredients on your shopping list to make these quick and easy no-bake protein bars when you get home. Start by adding 4 cups of rolled oats to a large bowl. Next, add 4 scoops of protein powder—I like using chocolate whey isolate, but the flavor is all up to you. Next, add half a cup to 1 cup of nut butter. You can use natural peanut or almond butter, but if you want a little extra flavor I recommend a brand called “Nuts ’N More.” They have a great selection of flavors like “Chocolate Almond,” “Toffee Crunch,” and more, with no added sugars and with great servings of protein and healthy fats. Once you’ve combined all the ingredients in a large bowl, grab a wooden spoon and start mixing. The mixture can be pretty thick, so you might want to add some water. Start with a tablespoon of water, and if needed add up to a quarter cup—any more than that and it will likely become too liquidy. Also, if you want to forget about the spoon and use your hands, the mixing process will be a lot easier! When it’s mixed to your satisfaction, scoop it out onto a baking sheet—like the kind you use to make brownies—and flatten it into a layer with a spoon, a spatula, or the palms of your hands. If you like, add a thin layer of nut butter, dried berries, crushed nuts, shaved coconut, or dark chocolate shavings over top to add a little more flavor. Just remember to pay attention to how much you’re adding and account for it in your nutrient count! If cut into 16 square bars, each bar has: 157 calories; 12 g protein; 17 g carb; 4 g fat. And remember, measure and include any other additional toppings for an accurate calorie count. Beat the late-day lull and urge to snack at the Fourth of July cookout this year by bringing these easy no-bake protein bars. They are healthy and filling and will help you get the most out of your long weekend!